Irish history reports-free for you to download. The Easter Rising 1916,The 1798 Rebellion,The Great Famine and more. Free resource from The Information about Ireland Site. The Easter Rising: The Information about Ireland Site is proud to present the 1966 genuine Irish postage stamps that commemorated the 50th anniversary of the 1916 Easter Rising. The cost of these stamps presented on a quality print illustrating the 'Declaration of Independence' read by Padraig Pearse on the steps of the G.P.O. in Dublin is only US$40 packing and delivery included. To view the print click here. You can get it from our secure order page by clicking here. 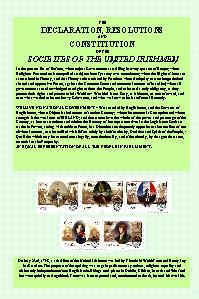 The 1798 Rebellion: The 1798 rebellion had its 200th anniversary commemorated in Ireland by the release by the Irish post office of a set of 5 superb stamps. 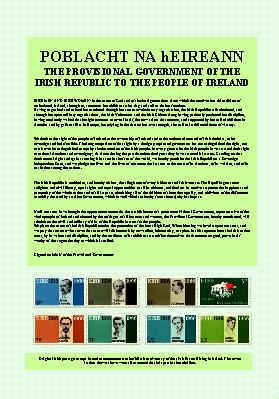 These stamps are availabe to you and are presented on a quality print showing the opening page of the constitution of the United Irishmen - the organisation behind the rebellion. This unique collectible is available to you for only US$20. To view the print click here. You can get it from our secure order page by clicking here. 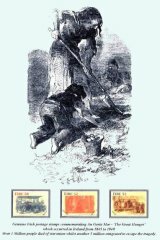 The Irish Famine: To commemorate the 150th anniversary of the Irish Famine, the Irish Post Office issued a set of 3 commemorative stamps depicting this tragic event in Irish history. These stamps are available to you on request and are presented on quality prints representing the subject. Prices are from US$10 and shipping and handling are free. You can get these wonderful collectibles at our secure order page by clicking here . To view the prints click on the links shown below.